In the United States, Ground Hog Day, known as Candlemas in other parts of the world, is a day on which the weather pattern for the following six weeks will be determined, not by science or methods of meteorology, but by a ground hog. That’s right, a ground hog. German and English immigrants originally brought the custom of predicting the weather patterns in the midst of winter to determine the advent of spring to America. Basically, what happens is this: If a ground hog or wood chuck comes out of his winter hole on February 2nd and sees his shadow, six more weeks of winter are on the horizon. If the ground hog doesn’t see his shadow because of clouds, it means that winter will soon give way to a warm and pleasant spring. Scientific? No. Fun? Yes! The tradition of Ground Hog Day is not in any way connected to any religious celebration, which makes it different from many other American holiday traditions. The tradition of watching the ground hog in America became popular mainly in Pennsylvania, perhaps due to the amount of German immigrants who made their homes in that state after arriving in America. However, it is in northwestern Pennsylvania that the behavior of the ground hog has accrued the most fame, in a town where the Punxsutawney Ground Hog Club first appeared in 1898. Members of local Punxsutawney town claim they are the ‘home of the traditional weather forecasting ground-hogs’. Every year, town members, and over the years, members from communities throughout the United States, travel to Punxsutawney to watch the ground hog, nicknamed, ‘Punxsutawney Phil’ either scoot back into his winter hole or stay aboveground to explore and eye the hundreds of humans watching his every move. The observance begins as people take a short walk up Gobbler’s Knob in the rolling foothills of the Allegheny Mountains to watch the antics of the ground hog as he emerges from his den. The actions of the mammal are immediately reported to newspapers across the country, and either brings smiles or frowns to those anticipating an early spring. Another rival ground hog club founded in Lancaster County, Pennsylvania that calls itself the Slumbering Groundhog Lodge of Quarryville, was begun in 1908. Their members swear to protect the ground hog from all sorts of tragedies, including ending up in local stew pots. These two groups fan out and watch for the activities of ground hogs in their vicinity every year on February 2nd, sometimes arriving at specific locations before dawn in order to catch every potential move made by the elusive ground hogs. In Quarryville, the day is celebrated with fun and games to mark the eventful day. 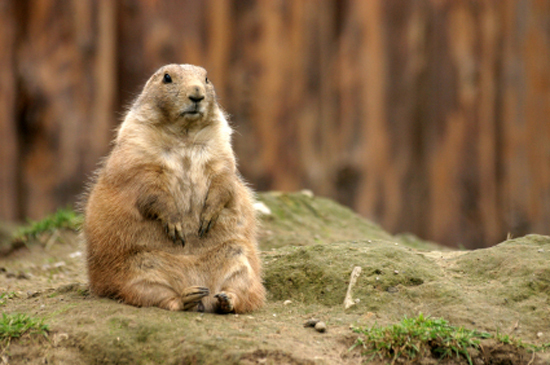 Other ground hog groups founded in Pennsylvania, among them the Greater Philadelphia Grounghoggers, have spent decade’s carefully watching ground hogs on February 2nd. The antics of these clubs has gained an international reputation, though the National Geographic Society announced that the entire ground hog idea as ridiculous, and weathermen decided long ago that the ground hog as a weather forecaster was only correct 28% of the time. Nevertheless, Ground Hog Day is recognized and observed around the United States, on February 2nd and offers American citizens an opportunity for good, traditional homespun fun, and people around America join in with laughter and winks. School children are often read the story of ‘Punxsutawney Phil’ and learn about the ground hog mammal, who is given a great deal of attention and respect, for a few days anyway. Ground Hog Day, while not a national holiday, has nevertheless become an ingredient of American tradition and folklore, and will no doubt continue to be observed, if only tongue in cheek. 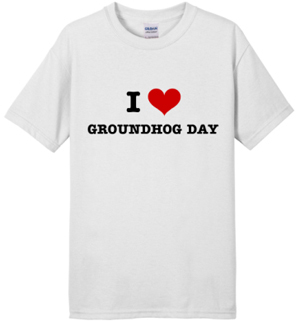 Celebrate the day with your own Groundhog Day T-Shirts or create your own custom t-shirt for Groundhog Day.